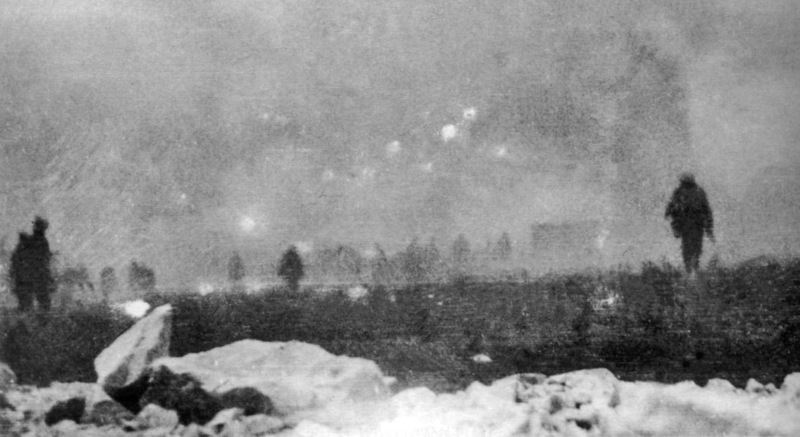 British troops from the 47th Divison (2nd London) advance towards the German trenches through a cloud of mustard gas on the first day of the Battle of Loos (25 September 1915). The gas had been released by the British themselves, but most of it blew back into their own lines. The event is described in detail by the poet Robert Graves in his war memoir, Goodbye To All That. The Battle of Loos dragged on until mid-October, with neither side able to claim any sort of victory. The casualties included Rudyard Kipling’s son John, whose body was not found for many years, prompting one of Kipling’s most famous poems, “My Boy Jack”. My great-grandfather, William Ellis, was wounded in a diversionary action north of the main battle site on 4 October and died of his wounds in a military hospital in Nottingham almost three months later.